Reserpine, an alkaloid present in the root of the Indian plant Rauwolfia serpentina. Reserpine, an alkaloid present in the root of the Indian plant Rauwolfia serpentina (Fig 22.1), has been used for treating hypertension for decades, and is also indicated in the treat- ment of Raynaud’s phenomenon. Related alkaloids include alseroxylon, deserpidine, raubasine, and rescinnamine. Reserpine is readily absorbed following oral and intra- muscular dosing. Peak plasma level is reached 1 to 3 hours postingestion. Six percent is excreted in the urine in the first 24 hours, and about 8% in the first four days, mainly as the metabolite trimethoxybenzoic acid. Up to 15 to 60% of the dose is eliminated in the faeces. Reserpine and its congeners deplete catecholamines and serotonin peripherally and centrally from nerve terminal fibers. The resulting responses exhibit as CNS depression and peripheral sympatholysis. Rescinnamine, also isolated from the root of Rauwolfiaserpentina is used to treat some types of hypertension. 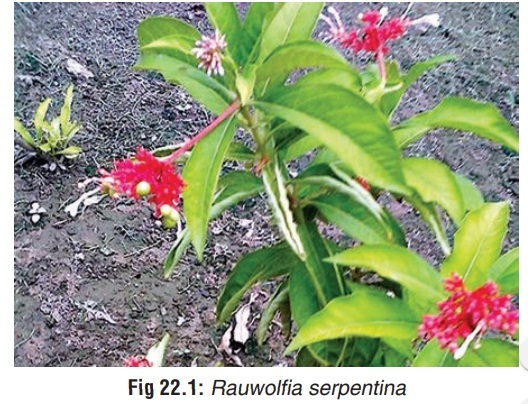 In India,a crude extract of Rauwolfia serpentina (e.g. Sarpagandha) has been used for centuries to treat insomnia and certain forms of mental illness. The adverse effects of reserpine include orthostatic hypoten-sion, dizziness, blurred vision, bradycardia, nausea, vomiting, diarrhoea, and impotence. In addition, it often induces depres-sion, drowsiness, hallucinations, nightmares, nasal stuffiness, and exacerbation of peptic ulcer disease. It is contraindicated in patients with a history of depression because of the risk of precipitating suicidal behaviour. Overdose produces profound CNS depression. Patients may initially demonstrate hyperten-sion and tachycardia for up to one day followed by hypoten-sion and bradycardia. Non-reactive and pinpoint pupils occur frequently after overdose. Higher doses may produce cardiac arrhythmias and an angina-like syndrome. CNS depression occurs, ranging from drowsiness, lethargy, and mental depres-sion through stupor and coma. Coma may be long-term, but mild, often allowing the patient to be aroused when needed. Peripheral responses are biphasic: initially they may demon-strate catecholamine release, then depletion. Diarrhoea and intense gastric acid secretion may occur. Parkinsonism may develop in patients being treated with reserpine, particularly at higher dosages. Endocrine disorders causing breast engorgement, galactorrhoea, and gynaecomastia have been reported. Severe stuffy nose, lethargy, and respiratory depression may occur in infants of mothers ingesting reserpine during pregnancy. Since it is excreted in breast milk, serious adverse reactions are possible in nursing infants. Adrenaline and noradrenaline urine levels may be elevated one to two days after an acute ingestion. It has been recom-mended that overdosed patients should be observed for a minimum of 72 hours, due to the long duration of action. For hypotension, infuse 10 to 20 ml/kg of isotonic fluid and place in Trendelenburg position. If hypotension persists, administer dopamine or noradrenaline. Consider central venous pressure monitoring to guide further fluid therapy. Alprazolam may help counter reserpine-induced depression.